Join us for this engaging and practical series! The current series is in progress – get in touch to be notified about the next series! 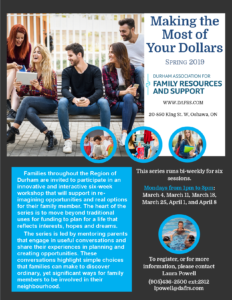 Families throughout the Region of Durham (and beyond) are invited to participate in an innovative and interactive six-week workshop that will support in re-imaging opportunities and real options for their family member. The heart of the series is to move beyond traditional uses for funding to plan for a life that reflects interests, hopes and dreams. The series is led by mentoring parents that engage in useful conversations and share their experiences in planning and creating opportunities. 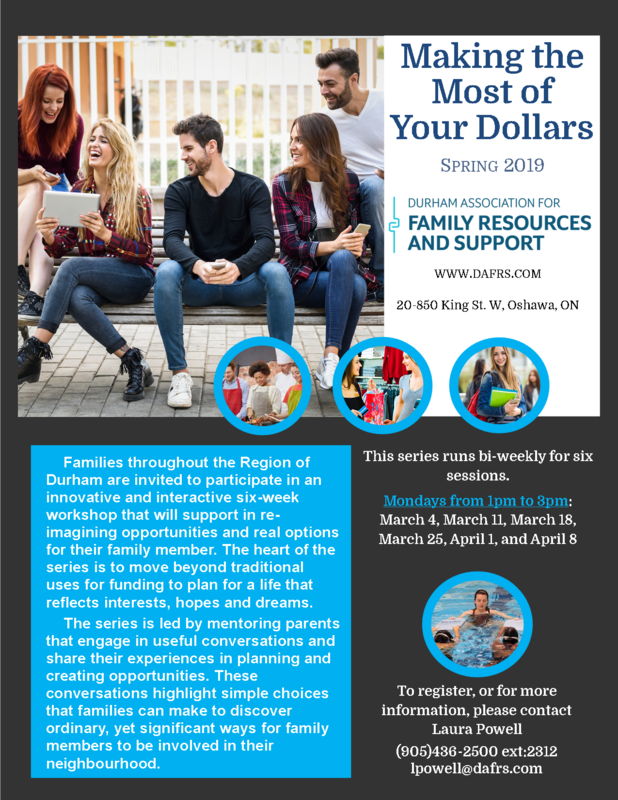 These conversations highlight simple choices that families can make to discover ordinary, yet significant ways for family members to be involved in their neighbourhood. Contact Laura for more details! See and share the flyer here!